Right off the bat you can see that this NAS is different. To date, there have only been slight variations in the QNAP lineup. For the most part, all their products have been black, that is until they released the TS-X51 lineup. Well, the X63 series is garnished in an absolutely gorgeous gold finish. I can’t regularly say that the color or styling of a NAS has made any impact on me, but this one surely has. The pictures truly do it no justice… seeing it in person is an absolute must. 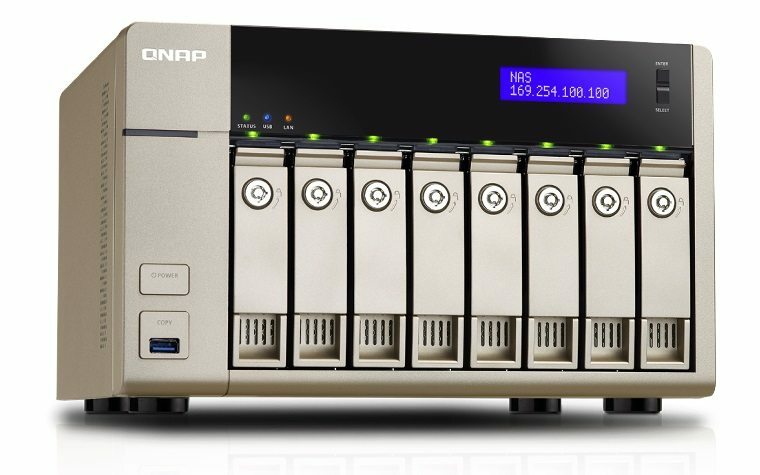 This NAS is a risky departure for QNAP. Gone are the days of ARM and Intel for their NAS lineup. Now we are Intel and AMD, and it is Intel vs AMD all over again. Except this time, the battle isn’t for who can hit 1GHz first (AMD did in June of 2000), instead it is who can deliver the most performance at the lowest price while keeping the power usage down. 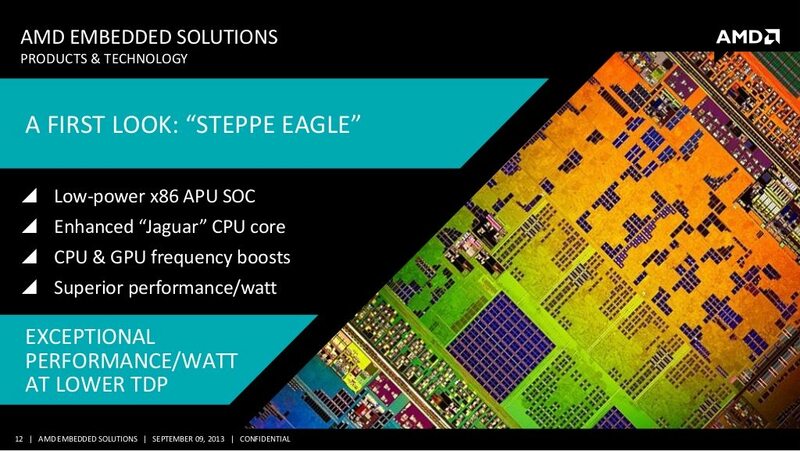 Although I will not go into who I think has a better processor, I can tell you that this AMD 2.4GHz quad-core processor is no slouch. The marriage between the TVS-X63+ and AMD brings a hardware encryption engine, support for up to 16GB of RAM, as well as GPU and I/O controller on the same die. 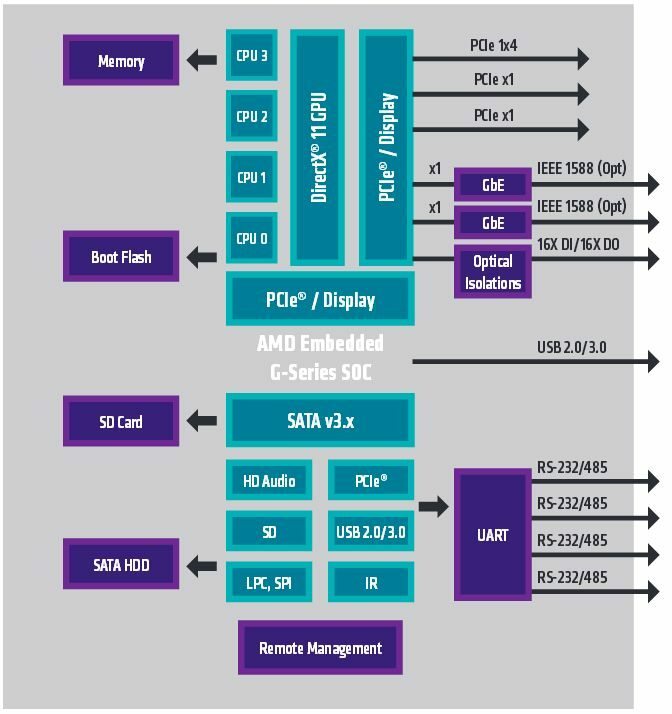 Additionally, the G-Series SoC with integrated Radeon HD GPU brings support for two simultaneous displays. 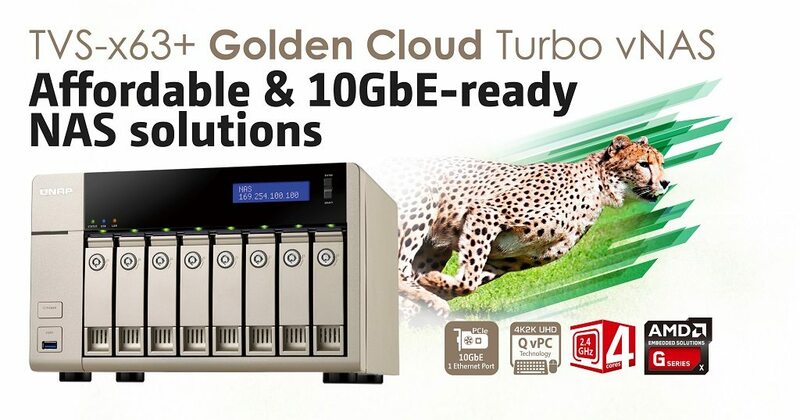 To get some of the basics out of the way, the TVS-863+ (TVS-863+-16G) is powered by the G-Series AMD Quad-Core Processor, our unit is outfitted with 16GB of RAM, has 8 x removable drive trays, 2 x Gigabit Ethernet Ports, 1 x 10GbE, 5 x USB 3.0, 2 x HDMI 1.4a (supports 4K video playback), measures 185.2(H) x 298.2(W) x 235.4(D) mm, has dual 120MM cooling fans, and weighs in at right around 17.26lbs. Like many others in the QNAP portfolio, the NAS can support up to two expansion enclosures. 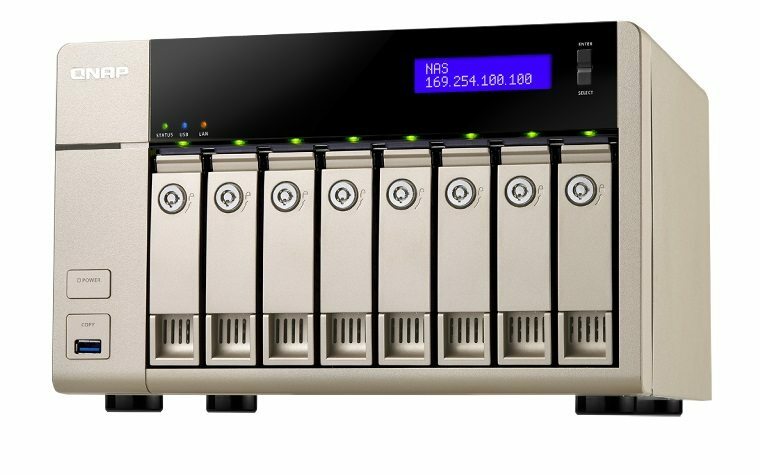 As with other NAS from QNAP, this NAS benefits from the same QNAP firmware, QTS 4. QTS 4 is jam-packed with features and is extremely easy to navigate. Right out of the box you get: FTP Server, File Server, Backup Center, Web Server, Radius Server, Syslog Server, Printer Server, Surveillance Station, VPN Server, LDAP Server, Proxy Server, Music Station, Photo Station, Video Station, DJ Station, Cloud Access via MyCloudNAS, Mobile Applications, and Much More. 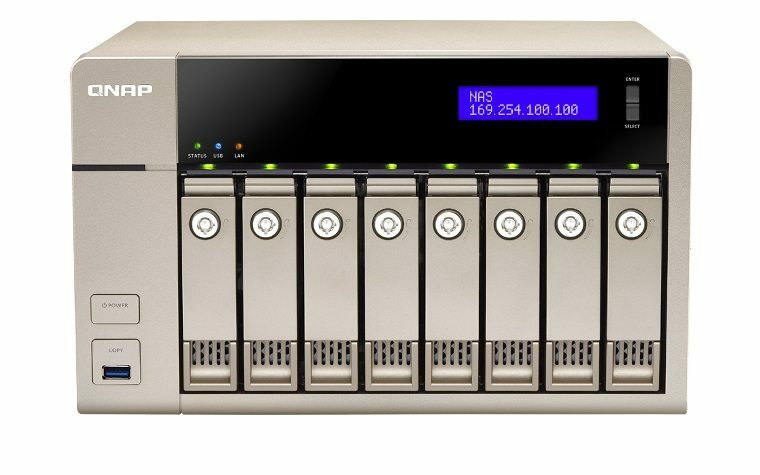 Enhancing the already functional NAS is easy with QNAP QPKGs. The TVS-863 is a Super Star! The NAS rocked the benchmarks and showed up in leather chaps and a sparkles.